1. 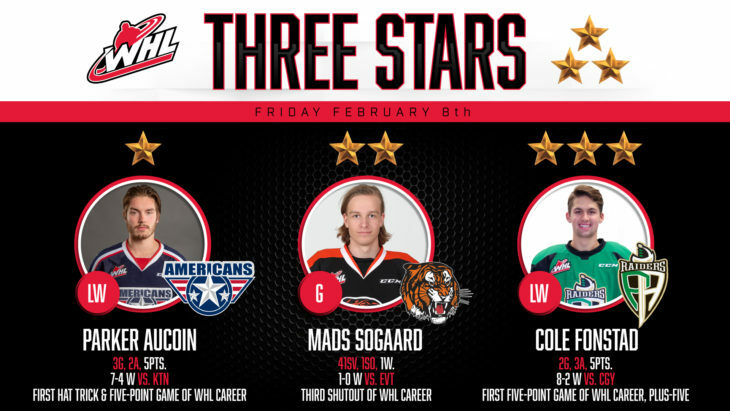 Parker AuCoin, Tri-City Americans: Tri-City Americans forward Parker AuCoin continued his strong year with the first hat trick and first five-point game of his WHL career in a 7-4 win against the Kootenay ICE. AuCoin had the first, fourth, and sixth goals of the game for the Americans, adding assists on the team’s second and eighth goals. The big night helped the St. Albert, Alta. product secure the first 30-goal season of his WHL career, adding to an impressive 58 points (30G-28A) in 50 games this season. Overall, AuCoin has 154 points (76G-78A) in 244 WHL regular season games. 2. 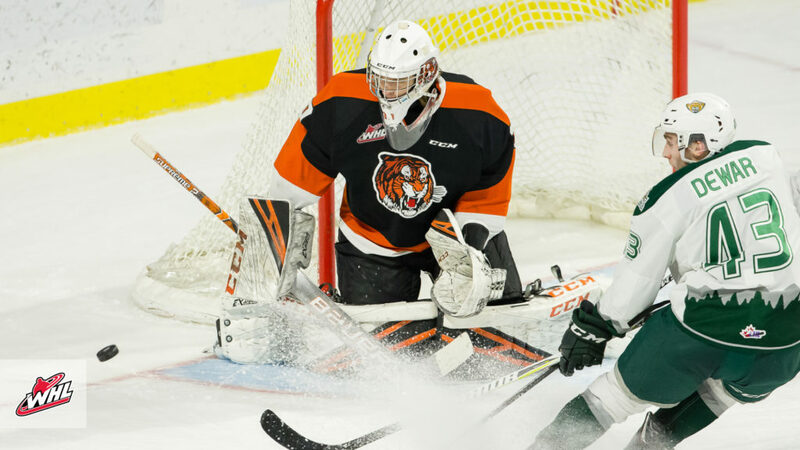 Mads Sogaard, Medicine Hat Tigers: 2019 NHL Draft prospect Mads Sogaard had a statement game Friday, stopping all 41 shots sent his way to shutout the Western Conference-leading Everett Silvertips by a 1-0 score. Sogaard stopped 17 shots in the first, 18 in the second, and six in the third for the third shutout of his WHL career. The Aalborg, Denmark product is now 14-4-2-2, with a 2.24 goals-against-average, a 0.933 save percentage, and three shutouts in 26 games this season. Sogaard is currently ranked third among North American goaltenders in NHL Central Scouting’s Rankings for this June’s draft. 3. 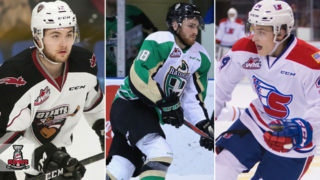 Cole Fonstad, Prince Albert Raiders: Montreal Canadiens prospect Cole Fonstad of the Prince Albert Raiders recorded the first five-point game of his WHL career Friday, scoring twice and adding three assists in an 8-2 win against the Calgary Hitmen. Fonstad scored the second and fifth goals of the game for the Raiders, adding assists on goals one, three, and seven for his team. Fonstad surpassed 100 assists for his WHL career in the victory. The Estevan, Sask. product now has 58 points (24G-34A) in 53 games this season and 158 points (56G-102A) in 196 WHL regular season games. Despite Swift Current Broncos goaltender Riley Lamb playing lights out against the Brandon Wheat Kings, the Manitoba team managed to pull out the shootout win, 3-2. Baron Thompson was the first to score, earning his sixth goal of the season. Adding a second goal to Brandon’s tally was Braden Schneider in the second period. Going short side on Brandon’s goaltender, Joona Kiviniemi notched the Broncos’ first goal of the game. With the extra attacker, the Broncos tied the game on an easy goal by Ethan O’Rourke. After a scoreless overtime, it took just three rounds in the shootout to settle the game in Brandon’s favour 3-2. Earning the first star of the game, Lamb stopped 53 of 55 shots. Brandon’s Ethan Kruger took the win after blocking 20 shots. 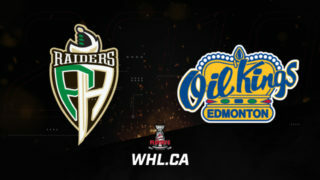 In typical Prince Albert Raiders fashion, accurate and concise play led to a solid win, 8-2, over the Calgary Wranglers (Hitmen). Recording four goals in the first half of the game, the Raiders took off strong. Dante Hannoun, Cole Fonstad (Montreal Canadiens), Noah Gregor (San Jose Sharks) and Sergei Sapego all notched a point for their team before Calgary’s Riley Stotts (Toronto Maple Leafs) put the Wranglers on the board. Gregor then scored again, twice, to record his second career hat trick with Fonstad and Eric Pearce also scoring a goal. With that tally, Fonstad racked up an impressive five points against Calgary. But, before the game was done, James Malm added another goal to the Wranglers score on a penalty shot, finalizing the game 8-2 for Prince Albert. Ian Scott (Toronto Maple Leafs) continued his amazing play in net, stopping 21 of 23 shots. The close games continued on Friday night with the Moose Jaw Warriors winning 4-3 in overtime against the Lethbridge Hurricanes. Matching goals within 10 minutes of the first period, Lethbridge’s Jake Elmer and Moose Jaw’s captain Josh Brook (Montreal Canadiens) both put one on the board. A quick goal by Calen Addison (Pittsburgh Penguins) followed by another Hurricanes goal from Taylor Ross gave Lethbridge the lead, but it wasn’t enough to ward off Moose Jaw’s offensive power. 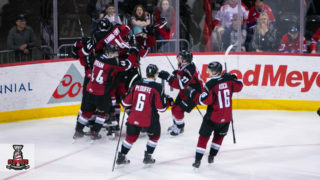 Justin Almeida (Pittsburgh Penguins) scored back-to-back goals to even the score and Brook stepped up in overtime to finish the game with a win for Moose Jaw. Standing tall in net, Brodan Salmond earned the first star of the game after he stopped 47 of 50 shots. A tight game between the Regina Pats and Red Deer Rebels resulted in a 3-2 overtime win for the East Division team. Although the first and third periods were intense, the second period held all the action. Exchanging two goals each, the teams couldn’t break their 2-2 tie until later in overtime. Cameron Hausinger and Brett Davis (Dallas Stars) were able to capitalize for the Rebels, but it was hot-streak player Ty Kolle and Logan Nijhoff who responded for the Pats. At 2:37 into overtime Pats player Ryker Evans broke the stalemate and recorded his first career WHL goal on the power play. With the Rebels outshooting the Pats, Max Paddock’s 31 saves in the game for Regina were needed to keep the team alive and eventually win. 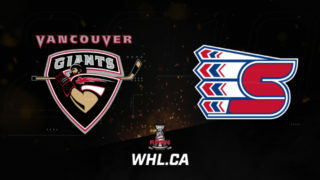 Although the majority of the game was locked in a 1-1 battle, the Giants pulled out a strong third to take the win 3-1. In the first, a scramble around the net gave Lukas Svejkovsky a chance to score his 10th goal of the season to take the lead 1-0 for Vancouver. Later Svejkovsky would assist on Vancouver’s other two goals to earn the first multi-point night of his career. In the second period, determined Kamloops player Connor Zary, drove his goal home to tie the game, 1-1. Earning his second point of the night after notching an assist on the Giants first goal, Tristen Nielson ripped it glove side to get the game-winning goal. Less than two minutes later on the powerplay, Nielson notched his second goal of the game to seal the win. Taking the fifth win against the Kamloops Blazers this season, 2019 NHL Draft prospect Trent Miner stopped 26 shots. 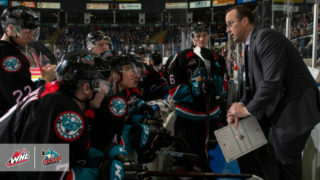 Mark Liwiski’s sixth goal of the season stood up as the game-winning goal Friday as the Kelowna Rockets erased a 3-1 deficit to win 4-3 against the Prince George Cougars. The Cougars roared out to a 3-1 lead after 20 minutes as goals from Cole Moberg, and a pair of goals from captain Josh Curtis had the team rolling. The Rockets’ lone response in the period was a short-handed goal by 2019 NHL Draft prospect Nolan Foote. 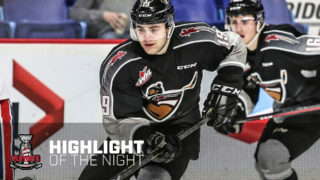 Just before the midway mark of the second period, the comeback began as Cayde Augustine potted the first goal of his WHL career followed by goals from Liwiski and Foote’s second of the game in the third. Taking over the game to start the second period, 2019 NHL Draft prospect Roman Basran stopped all 15 shots he faced to earn the victory. A 25-save performance from Shane Farkas as well as goals from four different skaters resulted in a 4-1 win for the Portland Winterhawks Friday against the Spokane Chiefs. 2019 NHL Draft prospect John Ludvig had a goal and an assist while Brendan De Jong (Carolina Hurricanes) and Seth Jarvis each had a pair of assists. Joachim Blichfeld (San Jose Sharks) scored his league-leading 44th goal in the first, adding to Ludvig’s tally to make it 2-0 after one. Lane Gilliss scored in the second to make it 3-0. Matthew Wedman’s 26th goal of the season put the Thunderbirds on the board, but an empty-net goal by Josh Paterson closed out the win. Four-point games from Ethan McIndoe and Nolan Reid powered the Spokane Chiefs to an 8-3 win against the visiting Victoria Royals Friday in front of an approving home crowd. Jake McGrew (San Jose Sharks) and 2019 NHL Draft prospect Luke Toporowski also contributed a goal and an assist each in the victory. Co-Captain Jaret Anderson-Dolan (Los Angeles Kings) netted the 100th goal of his WHL career while Connor Gabruch and Luc Smith also scored. Mitchell Prowse, Kaid Oliver, and Kody McDonald scored for the Royals in response. Chiefs co-captain Ty Smith (New Jersey Devils) and 2019 NHL Draft prospect Adam Beckman each added a pair of assists in the victory. Bailey Brkin stopped 28 of 31 shots to earn the win. Led by three goals and five points from Parker AuCoin, the Tri-City Americans earned a come-from-behind 7-4 win against the Kootenay ICE in the only meeting between the two teams in the 2018-19 WHL Regular Season. The ICE led after 20 minutes as captain and 2019 NHL Draft prospect Peyton Krebs, Cole Muir, and the first goal of Holden Kodak’s WHL career featured in the opening period. AuCoin’s first of the game and the 19th of the year from captain Nolan Yaremko featured as well to keep the score close. In the second, two more goals from AuCoin as well as strikes from Paycen Bjorklund and 2019 NHL Draft prospect Krystof Hrabik put the Americans in front 6-3 after 40 minutes. Hrabik’s second of the game and a goal by Jakin Smallwood would be the only goals of the third period. All four goaltenders saw action in Friday’s contest with Beck Warm stopping 23 of 24 shots to earn the victory. There’s a reason 2019 NHL Draft prospect Mads Sogaard of the Medicine Hat Tigers is ranked third among North American goaltenders by NHL Central Scouting. Sogaard stopped 41 shots for the third shutout of his WHL career Friday as the Tigers began their U.S. Division road trip with a 1-0 win against the Everett Silvertips. Sogaard stopped 17 shots in the first, 18 in the second, and six in the third for the clean sheet. The lone goal in the game came 16:40 into the second on a power-play goal by captain James Hamblin. Ryan Jevne and 2019 NHL Draft prospect Brett Kemp picked up the helpers. Opposite Sogaard, 2019 NHL Draft prospect Dustin Wolf stopped 28 of 29 shots in the game. Silvertips defenceman Jake Christiansen led the Silvertips with seven shots.